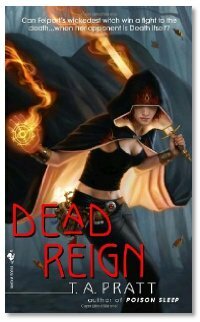 Interview: This week, Mike and Mike talk with Tim Pratt about the newest book in his Marla Mason series, Dead Reign. Tim talks changing gears and in writing his fiction, and changing names as a way to help market the Marla Mason books (to appeal to female readers more). Marla even has her own website, and you can keep tabs on her via Twitter! Discussion: Stackpole tells us about a new deal coming from Random House about their new rates for electronic books, and then tells us what's wrong with the way they're trying to go about building up their electronic book (PDF) inventory. Since Amazon and other electronic distributors can pay more per book than Random House is offering, what the motivation here? Check out the new Dragon Page "C" show, streamed live into Second Life, on Fridays at 4pm Pacific Time... you never know who might show up! Many thanks to all of the listeners who have been donating. Your support is truly appreciated. Link: Marla Mason: Sorceress. Crime Boss. Badass. Subterranean Press does this as well along with SRM Publishing. Granted it isn't all their titles but they are starting to do this.